This post contains affiliate links (click here for more info). Thank you for supporting Whistle and Ivy! Hello everyone! 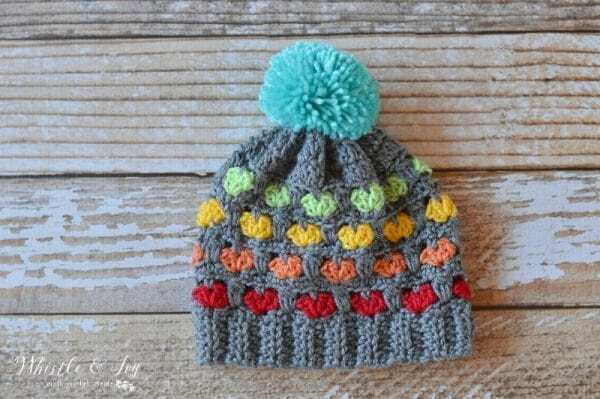 As August says its last goodbyes, I have been brainstorming fall and winter crochet ideas like crazy. Even though I love designing, I still enjoy working other designers’ patterns as well. 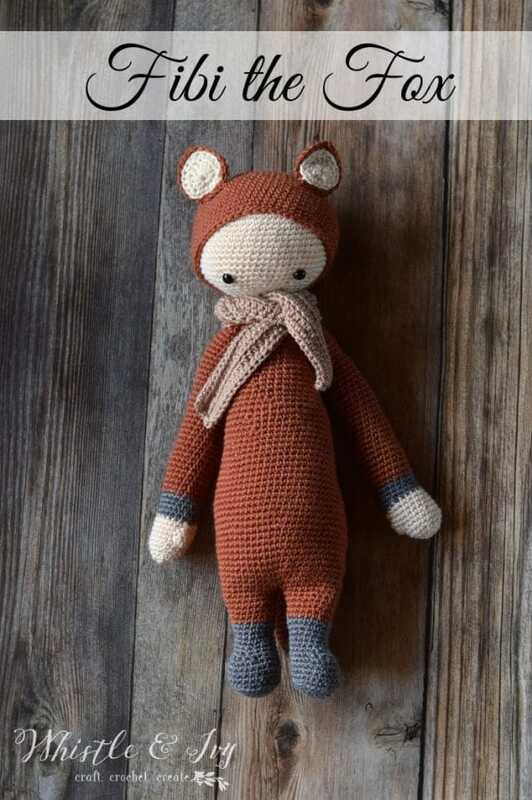 One pattern that has really been on my mind is Fibi the Fox, a Lalylala doll. Lalylala has some gorgeous patterns, but the crochet fox really caught my eye so I gave it a try. I didn’t realized until after I bought the pattern and yarn (which was a rookie mistake on my part) that the yarn it called for was finer than what I had. HOWEVER, since in America worsted weight is the most common yarn weight, I decided to forge ahead, hoping that my finished project wouldn’t be three feet long. I am SO happy with this project! This finished Fibi is the exact size I hoped it would be, about 19″. Amigurumi and stuffed toys are definitely not my strong suit. In fact, I really struggled sewing all the parts together (making them look pretty, at least). Also, because of the larger head size due to the worsted yarn, the head was rather wobbly on top. I am not sure if this happens with dolls made with the finer yarn. The thick scarf takes care of any wobbling, but I would be hesitant to make the Mici the Mermaid or Sepp the Seahorse in worsted yarn (or are the heads rather wobbly anyway?). 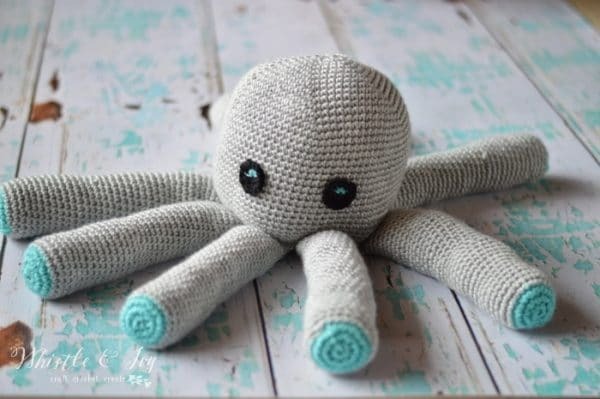 WHEN I make another Lalylala doll, I will make the body less long, and stop crocheting when the body/neck is big wider to hold the head up better. And since I am still basically failing in my attempt to learn to knit, I opted to crochet the scarf. To make a scarf like mine, Ch 100 and work a hdc in each ch (starting in the 2nd ch from hook). I made the scarf 5 rows wide and weaved in my ends. I also had to forego the white-tipped tail, simply because I played yarn chicken and lost! Her tail is tipped with all gray, but I think she is still adorable. I haven’t given this lovely crochet fox to Sis yet. I think I will save it for a while. Sis is not quite two and she might appreciate it a bit more in a few months. 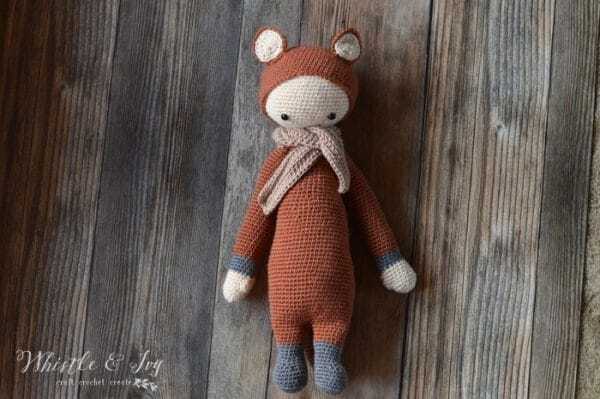 If you are interested in making your own Fibi the Fox, you can get the pattern HERE. 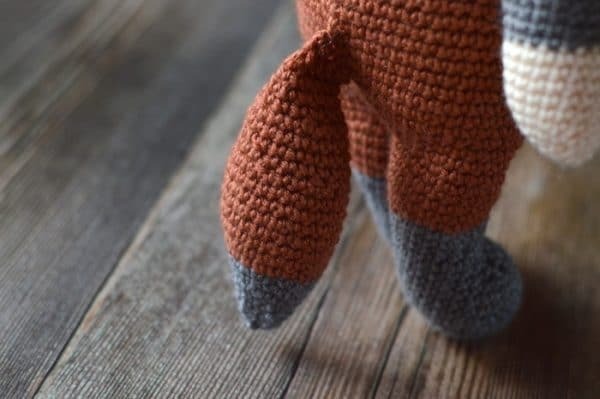 Like this crochet fox post? Subscribe! I’ve made several different dolls using Lalylala patterns. something that I just recently tried was stuffing the majority of the doll with pellets (little plastic seed-ish looking things) and then using stuffing to fill the neck bit while I crochet the head on (cuz trust me, you do NOT want to try to push those pellets into the body through a tiny hole in the top of the head) and then again to help keep them in the head while I close up the top (doesn’t have to look perfect up there, the hood hides any oopsies). I learned pretty early on that I do NOT like sewing the head onto the body, so I work the head backwards directly onto the neck, which lets me stuff the neck much more firmly than if I were to sew them together after the fact. (which is the reason the heads feel wobbly, there’s not enough stuffing in the neck) if you prefer to sew the head onto the body after both are finished, I would recommend getting a small dowel or wooden hook with a flat end, and using it to push stuffing into the neck as you sew it shut to make sure that it gets enough stuffing in there to hold up the head. (and yes, I’ve made some with worsted weight yarn, and even some with bernat blanket yarn) making sure the neck is stuffed SUPER firmly will keep the head from wobbling. You did an amazing job. I have made several of her patterns and I have noticed that some of her patterns have you making the head separate and sewing it on and others have you changing colors and hooking the head onto the body. My first pattern was the Lupo the Lamb, which called for a color change and then it increased for the head. 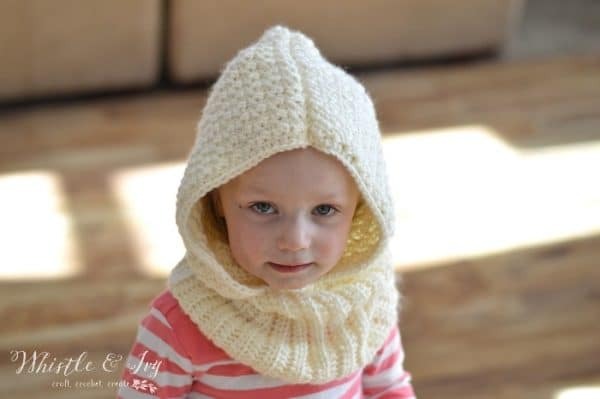 The pattern specifically stated to place a ball of stuffing firmly into the neck connection to keep the head from wobbling. So when I made some of her other patterns (Bina the Bear and Dirk the Dragon) I worked the heads in reverse and connected them directly to the dolls body. And like one of your other commenters said, I crocheted the arms into the second row from the top of the body so that they looked smoother and were less likely to come off if my goddaughter decided to rough house with her dolls. Thank you :) Oh intersting! I might use that other method next time. Maybe she counted on the scarf keeping the head from wobbling? It does actually work. I might need to sew mine in place so it’s permeant. Thanks for your kind words and the tips! Oh thank you for your tips! I am so new to making and sewing stuffed toys, I really appreciate your help! I am interested to see if your head-over-the-top method works, that sounds like a really good idea. I actually have a few needles shaped like that, and I never knew what they were for (I clearly do not sew things often!). I will definitely break those out for my next project. Thank you!!! I’ve had the pattern for this doll for over a year now and have yet to make it. I’m happy to see someone’s attempt and opinion of hooking it up. Thanks for the scarf input as well! You are welcome! I really enjoyed it, I hope you get around to it! Yes! Very helpful! Both pieces were open, but it seemed like it was perhaps too heavy for the width of the body. I don’t blame the pattern, I am 100% sure it was user error! Thank you for the tip, I will check them out. I got it to work, but I would be interested in knowing a “prettier” technique for sewing the parts together. The head and neck are an absolute MESS under that scarf ! !